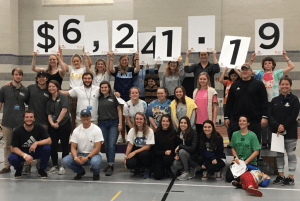 On March 9, Sewanee Dance Marathon at the University of the South hosted their second Dance Marathon. This was a year of firsts for SDM, as they spent the year forming new relationships with their community. This included a partnership with Sewanee Elementary School that engaged a wide range of new participants. At their event, students revealed a yearlong fundraising total of $6,241.19. We are so proud of the miracles that SDM made this year and look forward to what is in store for the future.